Christopher Whitelaw Pine (born August 26, 1980) is an American actor. Pine made his feature debut as Lord Devereaux in The Princess Diaries 2: Royal Engagement (2004). He is known for playing James T. Kirk in the Star Trek reboot film series (2009–2016), Will in Unstoppable (2010), Cinderella's Prince in Into the Woods (2014), Jack Ryan in Jack Ryan: Shadow Recruit (2014), Toby Howard in Hell or High Water (2016), Bernie Webber in The Finest Hours (2016), Steve Trevor in Wonder Woman (2017), Dr. Alexander Murry in A Wrinkle in Time (2018), and Robert the Bruce in Outlaw King (2018). ↑ "Chris Pine: Film Actor, Television Actor, Actor (1980–)". Biography.com (FYI / A&E Networks). Retrieved July 27, 2017. ↑ Turbiville, Tom (February 7, 2010). "Aggie connections move actor to help Bryan school". theeagle.com. Retrieved July 19, 2010. ↑ Chiu, Alexis; Huver, Scott (May 25, 2009). "Star Trek's Hot New Hero Chris Pine". People.com. Retrieved July 19, 2010. 1 2 3 Martin, Denise. "10 things you didn't know about Chris Pine". Los Angeles Times. Retrieved July 19, 2010. ↑ "Jews Making News: Seth Meyers Takes Over Late Night". Atlanta Jewish Times. 2014-02-26. Retrieved 2018-03-08. ↑ Smith, Krista (May 2009). "To Boldly Star". Vanity Fair. Retrieved July 19, 2010. ↑ "Chris Pine biography". TV Guide. Retrieved July 19, 2010. ↑ "Chris Pine, the Next Action Hero". Men's Journal. Retrieved November 12, 2017. ↑ "Search Results artistic : UC Berkeley Department of Theater, Dance, and Performance Studies". tdps.berkeley.edu. Retrieved October 20, 2017. ↑ "Chris's new role is light years from Leeds digs". Yorkshire Post. May 1, 2009. Retrieved July 19, 2010. ↑ "'Awards Chatter' Podcast — Chris Pine ('Hell or High Water')". The Hollywood Reporter. Retrieved February 15, 2017. ↑ "The King's Stag". Williamstown Theatre Festival. ↑ Robinson, Paul (April 23, 2009). "Actor's Yorkshire days recalled as new Star Trek film hits the screens". Yorkshire Evening Post. Retrieved July 19, 2010. ↑ Torre, Nestor (May 15, 2009). "Star Trek launches Chris Pine to stardom". Philippine Daily Inquirer. Archived from the original on May 19, 2009. Retrieved July 19, 2010. ↑ "Chris Pine Covers Out: 'Star Trek Into Darkness' Star Dishes On Gay Roles, Love Scenes". Huffington Post. May 6, 2013. Retrieved February 15, 2017. ↑ "In 'Just My Luck,' Lindsay Lohan Is a Career Girl Hunting Love". New York Times. May 12, 2006. Retrieved February 15, 2017. ↑ "Sometimes Pulp Fiction Emphasizes Pulp Over Fiction". New York Times. January 26, 2007. Retrieved February 15, 2017. ↑ "A Reporter's Machiavellian Side". New York Times. November 30, 2006. Retrieved February 15, 2017. ↑ "Hollywood's Chris Pine Stars in Off-Broadway's Atheist Starting Nov. 24". PlayBall. October 10, 2006. Retrieved February 15, 2017. ↑ "Bottle Shock". The Hollywood Reporter. January 28, 2008. Retrieved February 15, 2017. ↑ Carnahan, Joe (October 22, 2007). "Clooney Drops Out of White Jazz, Too". ComingSoon.net. Retrieved July 19, 2010. ↑ "Chris Pine was once "scared" to play Capt. Kirk". Access Hollywood. April 3, 2009. Retrieved July 19, 2010. ↑ Boucher, Geoff (May 7, 2009). "As Kirk, Chris Pine boldly goes where we've been before". chron.com. Retrieved July 19, 2010. ↑ "Star Trek stars beam up to SNL". Access Hollywood. May 10, 2009. Retrieved July 19, 2010. ↑ McNulty, Charles (June 25, 2009). "Review: Farragut North at the Geffen Playhouse". Los Angeles Times. Retrieved September 19, 2009. ↑ Reiner, Jay (July 13, 2010). "Review: The Lieutenant of Inishmore a gruesome pleasure". Reuters. Retrieved August 2, 2010. ↑ "Chris Pine, Ed Harris Win L.A. Drama Critics Circle Theater Awards". The Hollywood Reporter. March 15, 2011. Retrieved January 28, 2014. ↑ Ditzian, Eric (June 4, 2009). "Exclusive: Chris Pine In Talks To Join Denzel Washington For Unstoppable". MTV. Retrieved July 19, 2010. ↑ Blank, Emily; Schutte, Lauren (November 15, 2010). "Hollywood's A-List Redefined". The Hollywood Reporter. Retrieved June 26, 2012. ↑ "Exclusive Clips from William Shatner's 'The Captains'". Trekmovie.com. July 18, 2011. ↑ Claggett, Bruce (September 12, 2010). "Film starring Reese Witherspoon to be shot in Vancouver". NEWS1130. Archived from the original on March 23, 2012. Retrieved September 20, 2010. ↑ Abrams, Rachel (April 11, 2011). "Fox dates 'Chronicle,' 'This Means War'". Variety.com. Retrieved April 12, 2011. ↑ Swayne, Valerie (July 6, 2012). "'Rise of the Guardians' Trailer Delves Into Jack Frost's Backstory". hollywoodreporter.com. Retrieved April 15, 2015. ↑ Breznican, Anthony (January 10, 2011). "EXCLUSIVE: Michelle Pfeiffer cast as Chris Pine's mom in 'Welcome to People'". Entertainment Weekly. Retrieved January 28, 2011. ↑ Hepburn, Ned. (November 24, 2011) 'Star Trek' Sequel To Open May 17th, 2013 Archived November 27, 2011, at the Wayback Machine, Blackbookmag.com; retrieved June 24, 2012. ↑ Leins, Jeff (October 13, 2009). "Chris Pine in Talks to Play the New Jack Ryan". News in Film. Retrieved October 17, 2009. ↑ "Chris Pine in Talks to Play Jack Ryan". ComingSoon.net. October 14, 2009. Retrieved July 19, 2010. ↑ "Chris Pine in Talks to Star in Disney Coast Guard Drama". The Hollywood Reporter. April 17, 2014. ↑ "Chris Pine Thriller 'The Finest Hours' Pushed to 2016 by Disney". The Wrap. April 8, 2015. ↑ "'Wet Hot American Summer': Chris Pine, Kristen Wiig, Jon Hamm & Jason Schwartzman Join Cast". Deadline. January 28, 2015. ↑ "Crackle Sets Premiere Dates For 'The Art Of More', 'Supermansion', 'Comedians In Cars…' – TCA". Deadline. August 5, 2015. ↑ "'Comancheria' With Chris Pine, Ben Foster & Jeff Bridges Acquired By CBS Films". Deadline. May 4, 2015. ↑ "Chris Pine's 'Hell or High Water' to Hit Theaters in August". Variety. May 3, 2016. ↑ "Filming Begins on Star Trek 3 at the Squamish Boulders in British Columbia". ComingSoon.net. June 25, 2015. ↑ "'Star Trek: Beyond' Gets New Release Date". Variety. September 17, 2015. ↑ "OUTSTANDING CHARACTER VOICE-OVER PERFORMANCE - 2016". Television Academy. ↑ "Complete list of 2016 Emmy nominations and winners". Los Angeles Times. September 18, 2016. Retrieved October 3, 2016. ↑ "BWW Exclusive World Premiere: Watch Barbra Streisand & Chris Pine Take on MY FAIR LADY on Her ENCORE Album!". Broadway World. August 24, 2016. Retrieved August 29, 2016. ↑ "Chris Pine Closes Deal to Star Opposite Gal Gadot in 'Wonder Woman' (Exclusive)". The Wrap. July 28, 2015. Retrieved May 3, 2017. ↑ "Warner Bros. Pushes 'Jungle Book' to 2018, 'Wonder Woman' Gets New Date". The Hollywood Reporter. April 6, 2016. Retrieved May 3, 2017. ↑ "February streaming calendar: 'Santa Clarita Diet,' 'Golden Girls'". USA Today. January 30, 2017. Retrieved February 13, 2017. ↑ "'Wet Hot American Summer: Ten Years Later' Trailer & Premiere Date: The Gang's All Here — Again". Deadline. June 22, 2017. Retrieved August 8, 2017. ↑ "Natalie Portman, Chris Pine, Ed Helms among guests on Angie Tribeca". Entertainment Weekly. February 9, 2017. Retrieved February 13, 2017. ↑ "'Breakthrough': Ana Lily Amirpour on How She Was Lured to Create an Animated Cancer Monster for Nat Geo". Indie Wire. May 2, 2017. Retrieved May 3, 2017. ↑ "Chris Pine Joins Ava DuVernay's 'A Wrinkle In Time'". Deadline.com. October 21, 2016. Retrieved July 29, 2017. ↑ "Disney Movie Release Schedule Gets a Major Update". ComingSoon.net. April 25, 2017. Retrieved July 29, 2017. ↑ "Netflix Lands Outlaw King". Deadline. April 24, 2017. Retrieved August 22, 2017. ↑ "Outlaw King | Netflix Official Site". www.netflix.com. Retrieved 2018-11-11. ↑ ""OUTLAW KING" STARTS SHOOTING". ECHO ARTISTS. August 21, 2017. Retrieved August 22, 2017. ↑ Kroll, Justin (May 5, 2017). "Chris Pine and Michelle Williams to Star in 'All the Old Knives' (EXCLUSIVE)". Variety. Retrieved October 13, 2017. ↑ "Chris Pine Rushes to Uncover Hollywood Mystery in 'I Am the Night' Trailer for TNT". The Hollywood Reporter. July 2, 2018. Retrieved July 4, 2018. ↑ "Star Trek 4 Still Being Written". Den of Geek. Retrieved November 12, 2017. ↑ Otterson, Joe (September 5, 2017). "Chris Pine to Star in Robert F. Kennedy Limited Series at Hulu". Variety. Retrieved October 13, 2017. ↑ "Patty Jenkins on Twitter". Twitter. Retrieved July 2, 2018. ↑ Kit, Borys (August 10, 2018). "Chris Pine and Chris Hemsworth 'Star Trek 4' Future In Doubt as Talks Fall Through (Exclusive)". Hollywood Reporter. ↑ Schmidt, JK (November 29, 2018). "'Spider-Man: Into the Spider-Verse' Features Chris Pine in a Surprising Cameo". ComicBook.com. Archived from the original on November 30, 2018. Retrieved November 30, 2018. ↑ "Interview Chris Pine". Femalefirst.co.uk. June 16, 2006. Retrieved August 26, 2009. 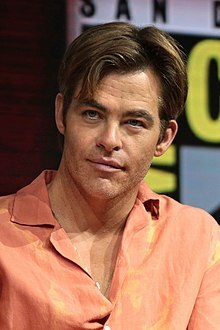 ↑ "Chris Pine, Captain Kirk actor, charged with DUI". CBC News. March 14, 2014. Retrieved February 14, 2016. ↑ "Chris Pine charged with DUI in New Zealand". Chicago Tribune. March 14, 2014. Retrieved February 14, 2016. 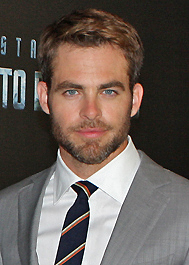 ↑ "Star Trek actor Chris Pine faces drink-driving charge in New Zealand". The Guardian. Retrieved March 12, 2014. ↑ Dally, Joelle (March 17, 2014). "Film star Chris Pine pleads guilty: Star 'devastated' by conviction". Christchurch, New Zealand: The Press. Retrieved March 17, 2014. ↑ "Chris Pine @ Jimmy Kimmel 16.02.12". Vimeo. Retrieved November 12, 2017. ↑ "Chris Pine Reveals His Politics Amid High-Risk 'Jack Ryan' Play". The Hollywood Reporter. Retrieved November 12, 2017. ↑ "'Star Trek': J.J. Abrams, Chris Pine, and more sign letter against Donald Trump". EW.com. Retrieved November 12, 2017. ↑ Bui, Hoai-Tran. "Joss Whedon, Chris Pine imagine if Congress was your coworker from hell". Washington Examiner. Retrieved November 12, 2017. ↑ Dessem, Matthew (November 1, 2016). "Chris Pine Is the Worst Co-Worker Ever (and Also a Republican Congressman) in the New Joss Whedon Video". Slate. ISSN 1091-2339. Retrieved November 12, 2017. ↑ "The Story Behind the Black-and-White Photo That Linked 'Batman v Superman' and 'Wonder Woman'". Yahoo Entertainment. June 13, 2017. Retrieved December 1, 2017. ↑ "Ovation Nominees". Lastagetimes.com. October 20, 2009. ↑ "Satellite Awards". International Press Academy. Retrieved February 16, 2016.